"[Knecht] exposes this world to readers in delightful anecdotes—some funny, some heartbreaking—and on every page displays an infectious lust for travel and adventure ... [and] draws readers in with charm and makes them feel a part oof the Pan Am experience." Read more. Bollywood movie in the works!! "....Knecht’s memoir takes readers up into the rarefied atmosphere of being an international flight attendant with iconic airline Pan American, with its special culture, exotic locales, and quirkiness.. .Debut memoirist Knecht is a very engaging schmoozer... An authentic voice helps this tale take off." "Wendy Sue Knecht has written a wonderful, entertaining book about her years as a Pan Am stewardess, and I enjoyed it more than I can say. I loved the glimpse she gave me of "the other side of the story" of those elegant, well dressed ladies who served us on board our flights. She added just the right amount of humor, celebrity stories, insider knowledge and anecdotes to keep me up late turning pages until I finished the book." Back when travel meant you dressed up, and airlines treated passengers like guests, traveling was the epitome of style and fun.....Knecht's book is a great read and I highly recommend her book. Wendy is a beautiful, honest, and entertaining storyteller who offers the reader a rare and fascinating glimpse inside the airline world during an era when caviar, champagne, and protocol was the norm, unlike today.....Go ahead, curl up with a glass of sumthin' and get ready to enjoy yourself. Seriously hard to put down. Loved this book!!! Great read ! Wendy has a fun, uplifting way of telling about her experiences with Pan Am. Her positive perspective and great sense of humor make this an enjoyable experience. I liked it so much, I am reading it again. Wendy really captured the whole of the Pan Am experience. Her wry humor spiced up details about training, the aircraft environment and the privileged layovers. Her close connection to those involved in the hijacking of Flight 73 in 1986 allowed her to paint an intimate portrait of the heroic crew. You won't be able to put it down! 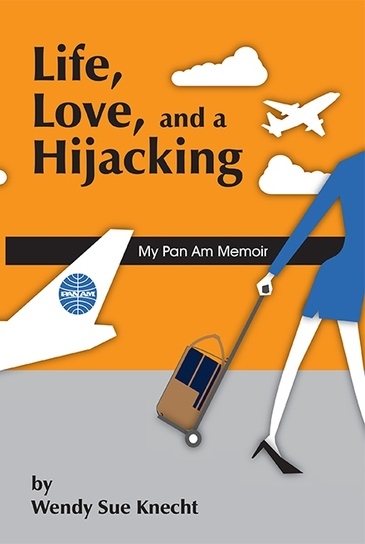 Life, Love and a Hijacking: My Pan Am Memoir by Wendy Sue Knecht is available at amazon.com in both softcover and Kindle versions.